The Kinivo BTC480 Bluetooth Car Kit is designed to provide a simple hands-free solution for answering and receiving phone calls while on the go. It also streams stereo music from your smartphone, tablet or other Bluetooth capable devices. Simple 3 button operation to stream music (play, pause, and change tracks) , receive phone calls and use voice commands with clarity. - Supports Bluetooth 4.0 profiles: HFP, HSP, A2DP and AVRCP. 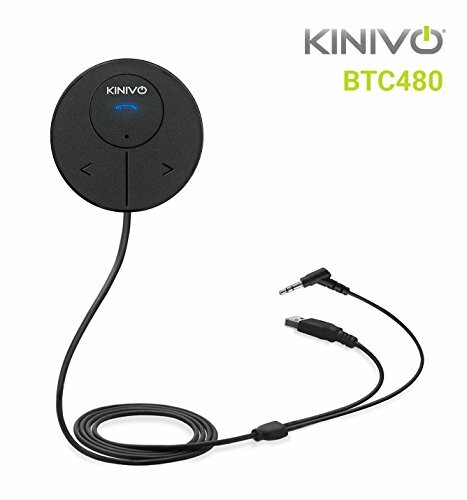 The Kinivo BTC480 Bluetooth Car Kit is backed by our 1 year warranty. Please contact us via email if you have any questions. Hands-Free car kit designed for answering and receiving calls with any Bluetooth smartphone - iPhone, Android, Blackberry etc. Multipoint Connectivity- Connect multiple devices at once via Bluetooth to your car stereo with the next generation of the popular BTC450 series Bluetooth 4.0 car kit with advanced Multipoint A2DP paring. Dual-Port USB Charger - Comes with a 10 watt 2.1A cigarette lighter power adapter that can charge two USB devices at the same time. Seamlessly stream music from any Bluetooth (A2DP) capable device. Built-in microphone and easy to use music controls. Echo and noise cancelling technology provide clearer calls. Routes audio through the 3.5mm AUX input to your Car Stereo when playing music and answering phone calls (Requires 3.5mm audio input in the car stereo). If you have any questions about this product by Kinivo, contact us by completing and submitting the form below. If you are looking for a specif part number, please include it with your message.